It is time to think about preparing your yard for Fall! Depending on what part of the country you are in, you are either excited to escape the heat and enjoy a cooler fall or you are hoping more warm sunny days will arrive before the trick or treaters show up at your door. But no matter how you feel about it, fall is on its way and summer will come to an end. 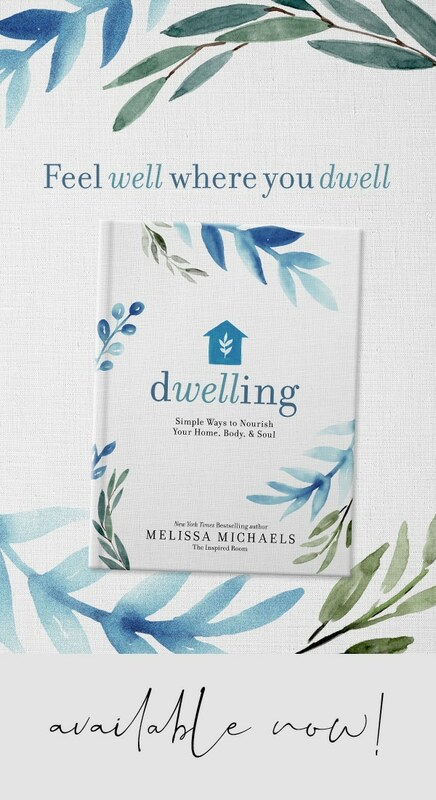 So what can we do now to be prepared for the change in season around our home? Remember when we got our puppy Jack a month ago, even though we weren’t fully prepared for a new dog in the family? Clearly we are not really the “prepare in advance” kind of people. One of the things we were definitely not prepared for was how DIRTY Jack would get while flying through our yard with the energy and exuberance only puppies can muster. And with that realization came the inevitable thoughts of how bad it will be outside when it is raining all the time. Because of the fear of muddy puppy feet all winter, I started thinking about adding more stepping stones and pathways to prepare for fall and winter. We can either get ready for fall NOW and do the work on a sunny day, or we can put it off for a nice cold RAINY fall day. Hmmm. Here are the 5 projects we need to tackle and maybe you do too! 1. 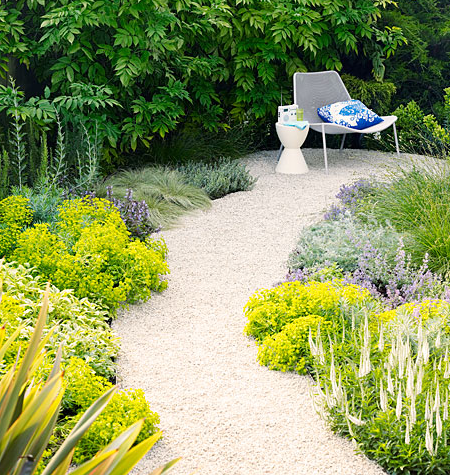 Do some late summer landscaping, such as adding fresh gravel or stepping stones to walking areas and some fall planting. Here are a few great articles I found on easy-care fall landscaping that might inspire you as much as they did me! It is not too late to improve your yard! 2. Freshen and Touch Up Exterior Paint. 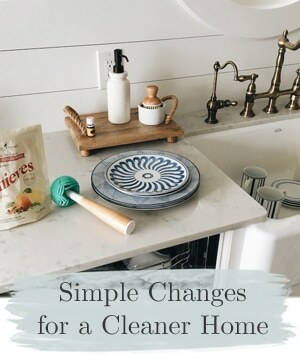 Bloggers like to paint interior furniture and accessories to make them pretty, but now is a great time to do some routine maintenance and touch up paint on the exterior of your home, including fences, garage doors, and the front steps. Fresh paint will not only protect exposed wood and siding from the elements, but fresh paint will increase the value of your home. And caulking around windows and doors needs to be done before it starts raining! 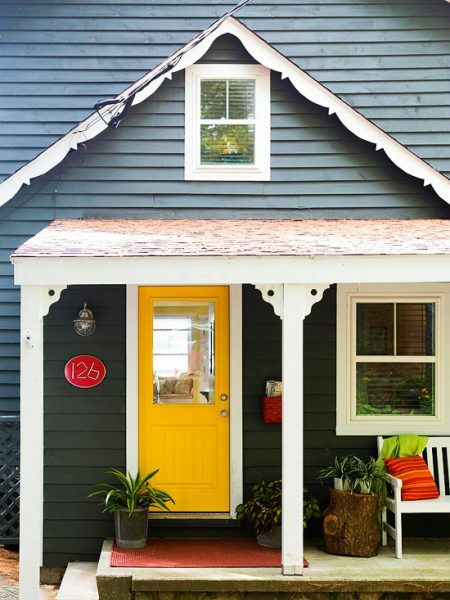 Tips for painting everything from your front steps, to the front door to siding and garage doors. 3. Clean all patios, furniture and outdoor umbrellas from all the pollen and dirt collected over the summer. If the climate in your area is favorable, you can still enjoy a few more weeks of using your furniture (all clean!) before you put the furniture away or cover it for the winter. 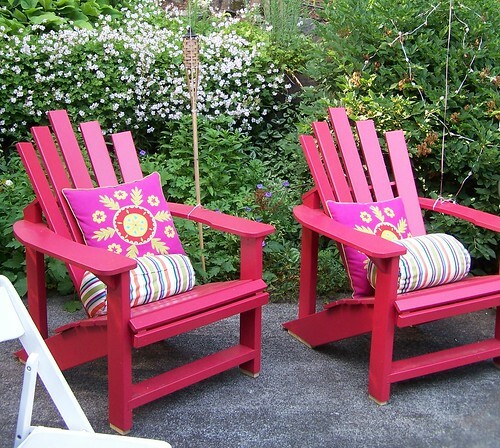 Need some tips on how to clean your outdoor furniture? I’m happy to share a couple of articles I found! 4. Clean your garage or shed and make room for outdoor patio cushions, garden tools & accessories. Ok, so if you garage is a little scary right now, how about cleaning it up before the weather turns cold and wet and you have to risk life and limb to venture out there in the cold months? I’ll admit our garage is a real hazard, which is why I’m mentioning this tip. Ok actually I’m hoping my husband is reading this and will get the hint. While you are cleaning up the garage or shed, make sure you you set aside some space to put your outdoor accessories and cushions when you are ready to pack them away for the winter months. 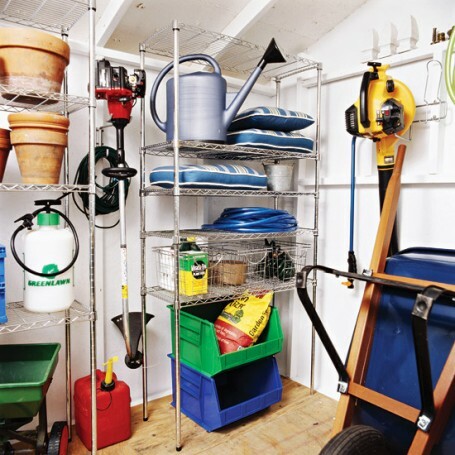 Storage Secrets to Organize a A Garage or Shed! 5. Clean Your Gutters and Downspouts. I know, this is the tip no one really wants to think about but everyone who owns a house needs to deal with. 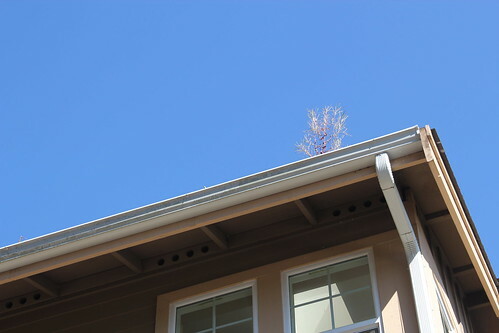 It is the project we dread…cleaning gutters and downspouts. Yes, that is a picture of our dirty gutter with a tree growing out of it. A TREE!!! Cleaning out and wiping off gutters when the skies are blue is much more fun (fun?) than when it is freezing and pouring down rain. And of course, by cleaning out your gutters you will save yourself possibly thousands of dollars of potential damage around your home from clogged drains. How to Clean Your Gutters. What is the one home maintenance project you are DREADING but need to get done before Fall? Jack is simply adorable! I bet he’s a lot of fun when he’s not in trouble!! 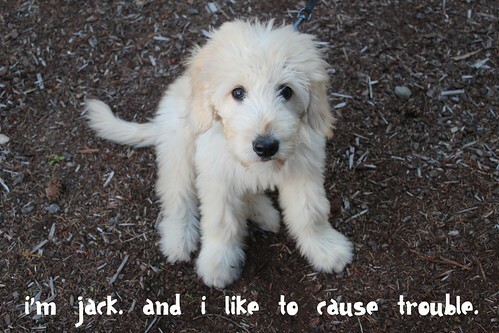 Puppies are the best…..but I have to say…i’m glad my girls are out of the puppy stage!! Yeah for no moe chewing! I definitely need to touch up the paint on our deck before we are inundated with snow and ice over the winter. BTW, I’ll babysit for Jack whenever you need a hand! Thank you!! I’m sure we’ll be calling you! LOL, he is a handful! I need to apply a few more coats of water sealant on my deck before winter/snow arrive. 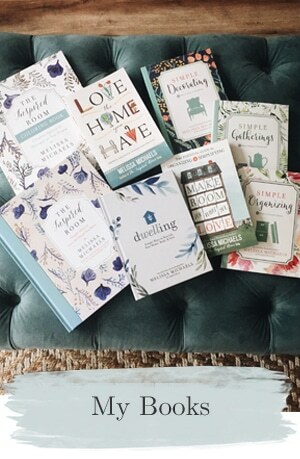 And let’s see…paint the benches and rocking chair on my front porch, get the yard ready for fall/winter, paint the wrought iron fence on the front porch and…. We absolutely need to clean our gutters. These are great tips for us seeing as this is our first fall with an actual yard. I can already imagine all the raking that’s coming in the next couple of months! We have got to get our deck repaired and re-finished. It looks so beaten down and sad. ): We’ll have to wait for temps to come down a bit and hopefully we will get some rain AFTER the project is complete. 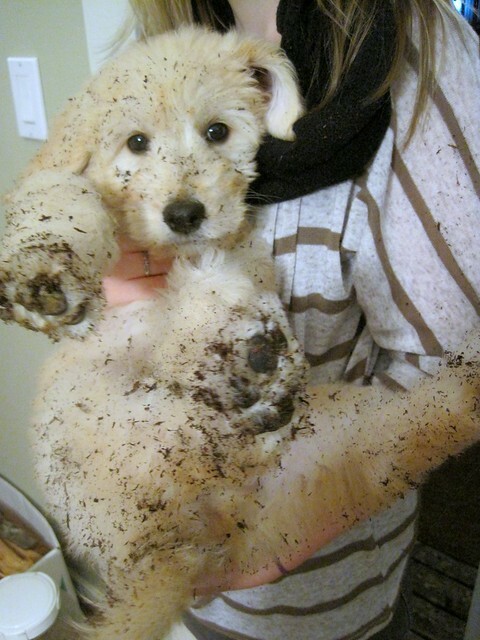 I cannot get over how cute that dirty puppy is!! Build our shed – we currently have no garage and no outbuildings! Paint my concrete window sills – they’re covered in flaking white paint right now. Your puppy, Jack, is adorable and has me considering getting another. Scout (our little rat terrier) is so lonesome since Buster died. 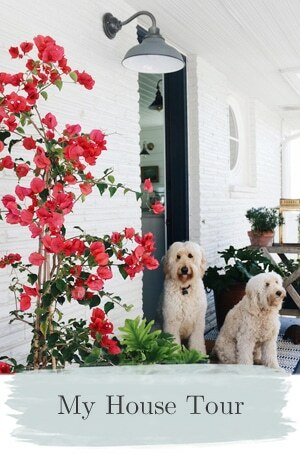 Thanks for sharing these great reminders to tackle outdoor projects before the colder weather arrives. We are going to be installing an in-ground sprinkler system. Jack is adorable and oh my how dirty he can get. You know he’s not gonna use those stepping stones right? LOL. Oh, way to burst my bubble. Ha, I can dream, right? Great tips! One chore I’ve been putting off is cleaning the windows. Luckily, we don’t have to have it all finished before fall comes…it’s still 80 degrees then! It is going to be 104 today where I am!!! I would so love to be planting fall flowers. I think I would rather work in the rain! Thanks for the reminder of fall! I am sure it will get here! What an adorable little puppy! Love the tips and the references. I definitely could get outside and freshen up some areas with some new paint! Our gutters are probably also due for a good cleaning. Thank you Diane, and you are welcome :-) Loved the bathroom re-do! 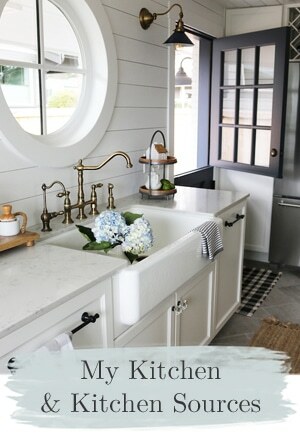 lollllllllllllllllllll omg i just love that dirty lil Jack hahahaha…..hope you are looking for a old vintage metal washing tub!! Jack is adorable! Believe me, I know all about the things a puppy can track in. Just this morning our 1-year-old lab (do I still call him a puppy?) rolled in something… gross, and then came into the house. But I love him all the same! Thanks for the great tips! 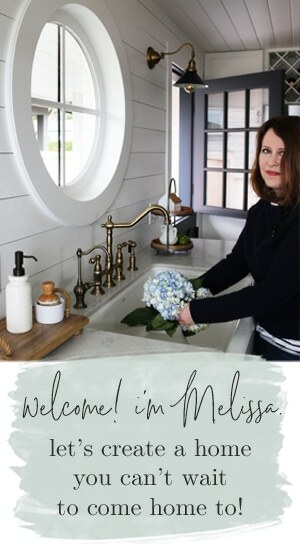 melissa- a teeny bit of advice from one golden doodle owner to another as you think about your yard in the spring…. whatever you do, DO NOT get triple shredded black mulch. i speak from experience!! oh the insanity of it all. thanks for the continued inspiration!